Meiji eimei hyaku eisen. Zen. Source: Professor Joshua Mostow Private Collection. One Hundred Poets (Hyakunin isshu) Collection. Mostow_009. Hyakunin Isshu (HNIS), or One Hundred Poets, One Poem Each, is without a doubt the anthology of Japanese poetry (waka). It has traditionally been attributed to the famous poet Fujiwara no Teika (1162-1241) and dated to the 1230s, though the earliest extant manuscript (and commentary) dates only to 1406. Regardless, it has had a profound influence on Japanese culture, and one of the ways it did was through the popularity of its very format, that is, one poem for each of one hundred poets (visit UBC’s extensive digital collection of Hyakunin Isshu here). “Variant HNIS” (ishu hyakunin isshu) is the name given to anthologies that use the same organizing principle as the original HNIS (now called the “Ogura HNIS” to distinguish it from its later progeny). The first, “The New HNIS” (Shin HNIS), was compiled in 1483 by the ninth Ashikaga shogun, Ashikaga Yoshihisa (1465-1489). 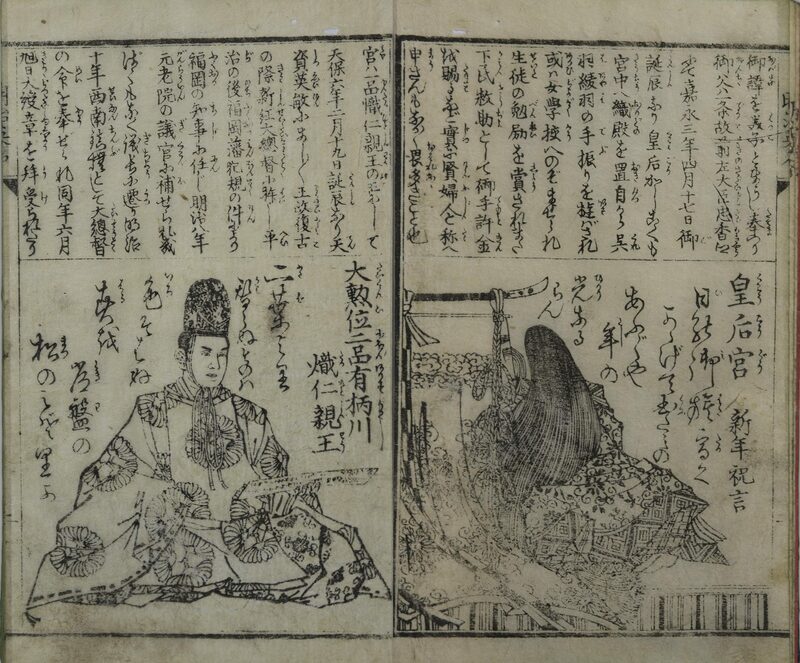 The anthology starts with poems by emperor Monmu (697-707) and his son emperor Shōmu (724-749), following the father-child relationship between emperor Tenji and empress Jitō in the Ogura HNIS. Likewise, the last two poems are by the father-son pair of emperors Fushimi (1288-1298) and Hanazono (1308-1318). From this it is apparent that it was not simply the idea of one hundred poets with one poem each that could be influential, but the internal structure of the Ogura HNIS and the relationships between the poets as well. Yoshihisa’s text became a popular one for calligraphic practice and the UBC collection has a woodblock-printed example by the well-known Edo-period literatus Tachibana Chikage, dated 1837 (fig. 1). Fig. 1. Jiemon (Ashikaga Yoshihisa), ed. Shin HNIS. Woodblock edition with calligraphy by Tachibana Chikage. Kyōto : Katsumura jiemon ; Ōzaka [Osaka] : Kawachiya Kihē … [and 4 others] ; Edo : Kitajima Junshirō. Tenpō 8 (1837). Source: UBC Library, Rare Books and Special Collections, Mostow_082. (Click to enlarge, or visit source here). Fig. 2. Book-wrapper. Ryokutei Senryū, ed. ; Gakō Gyokuransai Sadahide, illus. Eiyū HNIS. Edo: Yamaguchiya Tobē, Ka’ei 1 (1848). 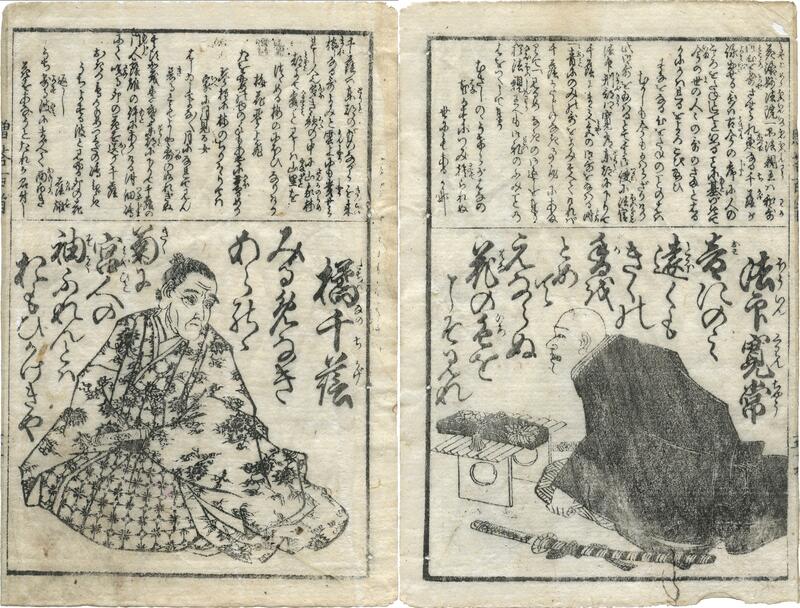 Woodblock-printed books were sold in a paper wrapper that was almost always thrown away—this is an example of a rare survivor. Source: UBC Library, Rare Books and Special Collections, Mostow_060 (Click to enlarge, or visit source here). It was in fact in the late Edo period that the genre of ishu hyakunin isshu really took off. A comic form of haiku developed in the mid-Edo period, promoted by someone named Karai Senryū (1718-1790), who published anthologies of the verses. This proved to be so popular that “senryū” not only became the name of the verse form, but also an inheritable title. It was Senryū IV (1778-1844) who published the first collection of humorous waka in the ishu hyakunin isshu format, with illustrations by Utagawa Kuninao in 1835. 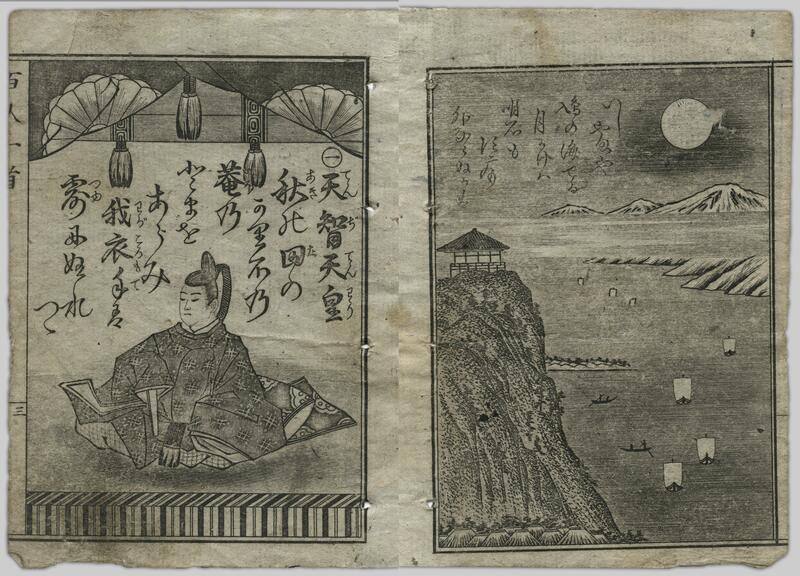 But it was his successor, Senryū V (1787-1858), who published at least eight ishu hyakunin isshu collections. His first was Eiyū HNIS, or “The Heroes HNIS,” originally published in 1844 (fig. 2) and reprinted several times thereafter. 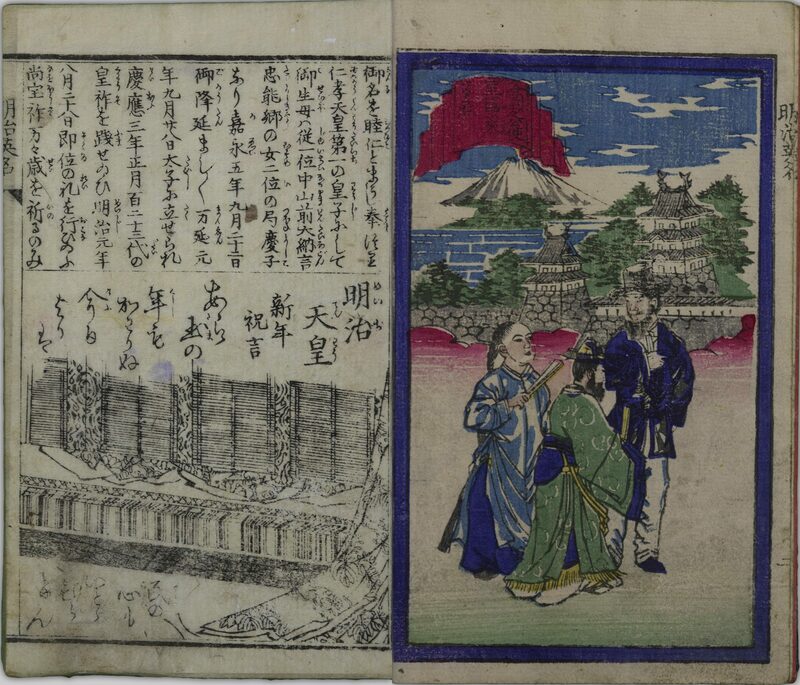 Clearly aimed at a male audience, the first poem is by the god Susano-o (with what is traditionally considered the very first waka, from the mytho-history Kojiki ), followed by Takenouchi no Sukune (a famous general from the Kojiki) and Shōtoku Taishi. It ends with none other than Ashikaga Yoshihisa. Senryū V went on to publish Retsujo HNIS (Exemplary Women, 1847, Mostow_006); Shūga HNIS (Surpassing Elegance, 1848, Mostow_021), which had illustrations by Hokusai and four other ukiyo-e artists of famous authors; Zoku Eiyū HNIS (Heroes Continued, 1849, Mostow_018); Giretsu HNIS (Exemplarily Virtuous, 1850, Mostow_020); Kitoku HNIS (Laudable, 1851); Kijin HNIS (Eccentric, 1852, Mostow_016); and Zōtō HNIS (Exchange, 1853). As can be seen, several of these included contemporary figures (fig. 3). Fig. 3. “Tachibana Chikage and Hōin Kanjō” from Ryokutei Senryū, ed. ; Utagawa Kuniyoshi, et al., illus. Zōtō HNIS. Edo: Yamaguchiya Tobē, Ka’ei 6 (1853). Source: UBC Library, Rare Books and Special Collections, Mostow_005. (Click to enlarge, or visit source here). The first ishu hyakunin isshu from the Meiji period appears to be Giretsu Kaiten Hyakku (One Hundred Verses of the Exemplarily Virtuous Encompassing the Heavens) of Meiji 7 (1874). The first verse is by Tokugawa Nariaki (1800-1860), famous for supporting the sonnō jōi (revere the emperor, expel the barbarians) loyalist movement, despite being the father of the last shogun. 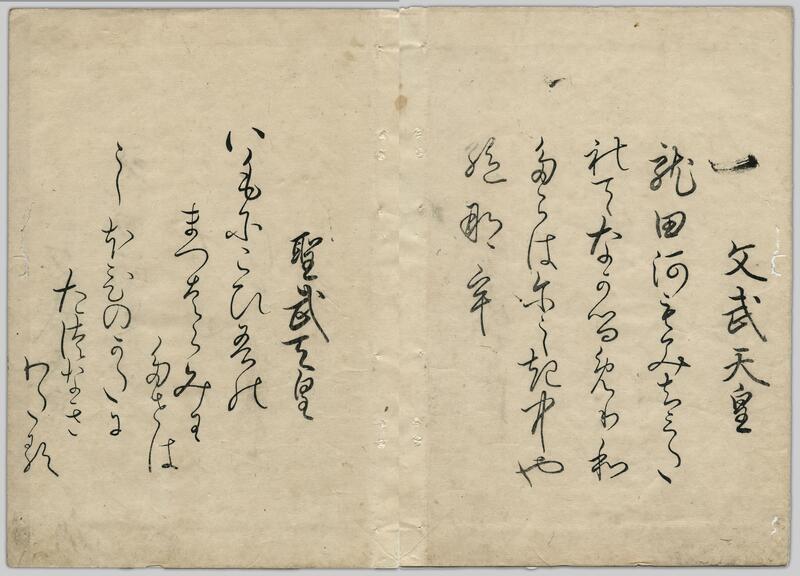 The last verse is by Katsu Kaishū (1823-1899), credited with forming Japan’s modern navy. Among the volumes in the UBC collection, the oldest Meiji example is the Meiji Eimei Hyaku’ei Sen (A Collection of a Hundred Poems by the Eminent of the Meiji Period), a woodblock printed volume published in Meiji 12 (1879). The frontispiece (kuchi-e, fig. 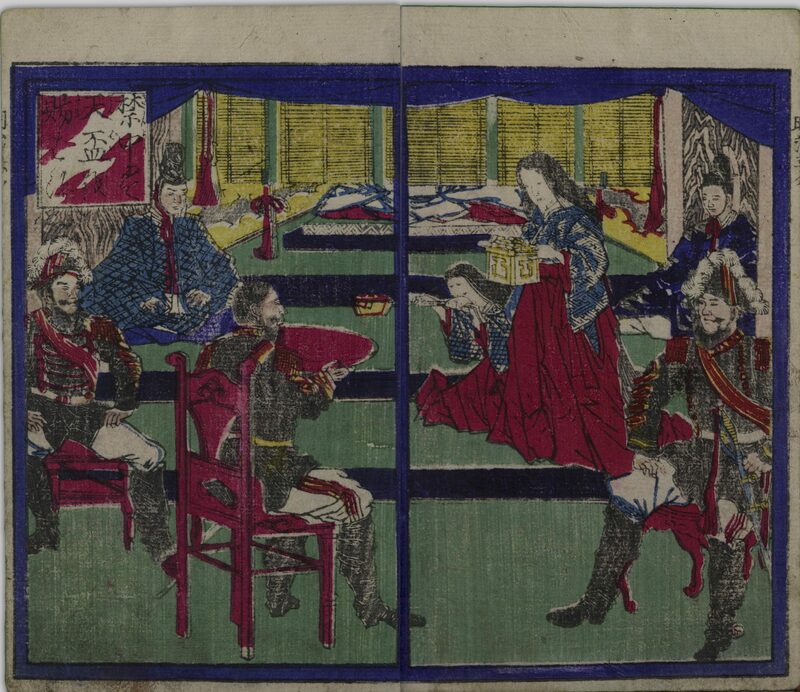 4) shows a military figure receiving an enormous cup of saké in the presence of the emperor (hidden by a blind); the caption reads: “Partaking of a heavenly cup within the Imperial Palace” (kinchū nite tenbai wo tamaharu). The next illustration (fig. 5) shows the ambassadors of China, Korea, and a western country making their way to court with a background of Mt. Fuji and the imperial palace. The first poem is a New Year’s waka by emperor Meiji , the second the same by the empress Shōken (fig. 6) (waka was re-introduced into court ceremonies and an annual New Year’s poetry contest inaugurated in 1869). The third poem is Imperial Prince Arisugawa Taruhito (1835-1895) who as Minister of War suppressed the Satsuma Rebellion in 1877 (fig. 6). Fig. 4. “Partaking of a heavenly cup within the Imperial Palace,” Shinoda Hisajirō, ed. ; Ikuda Hōshun, illus. Meiji Eimei Hyaku’ei Sen. Zen. Tokyo: Murakami Shinsuke (Bunsendō) , Meiji 12 (1879). Source: UBC Library, Rare Books and Special Collections, Mostow_009 (Click to enlarge, or visit source here). Fig. 5. Emperor Meiji and foreign ambassadors, Meiji Eimei Hyaku’ei Sen. Source: UBC Library, Rare Books and Special Collections, Mostow_009 (Click to enlarge, or visit source here). Fig. 6. Empress Shōken and Prince Arisugawa Taruhito, Meiji Eimei Hyaku’ei Sen. Source: UBC Library, Rare Books and Special Collections, Mostow_009. (Click to enlarge, or visit source here). In fact, royalty, the nobility, and soldiers figure largely in this selection. However, there is also a wide range of commoners. Familiar names include Iwakura Tomomi (1825-1883, misread as “Tomohira” [009_011]); Tokugawa Yoshinobu (1837-1913), the last shogun [009_013]; Saigō Takamori; Itō Hirobumi; the Chinese-style female painter and cross-dresser Okuhara Seiko; the female educator Atomi Kakei [009_071]; industrialist Shibusawa Eiichi; Fukuzawa Yukichi [009_081]; journalist Fukuchi Gen’ichirō [009_82]; and yōga artist Takahashi Yuichi [009_103]. Interestingly, many of the verses are actually in Chinese, including those by not only Okuhara but by Atomi as well (fig. 7). Fig. 7. Atomi Kakei and Okuhara Seiko, Meiji Eimei Hyaku’ei Sen. Source: UBC Library, Rare Books and Special Collections, Mostow_009. (Click to enlarge, or visit source here). Meiji 12 (1880) saw the publication of (Genkon) Eimei Hyakushu or (Today’s) Famous Names, A Hundred Poems. 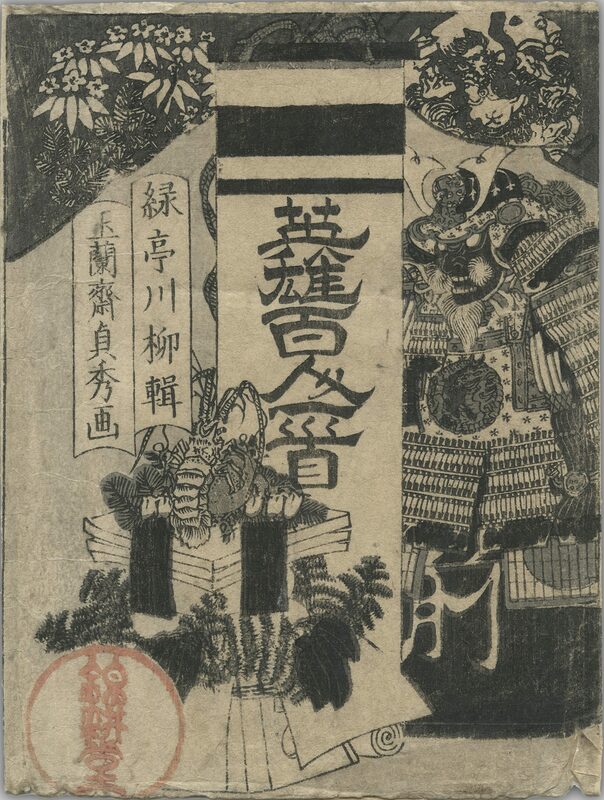 The book was popular enough for it to be reprinted, in its original woodblock-print form by a printer in Nagoya, and in a smaller format (12 x 8.6 cm) by copperplate in Tokyo. 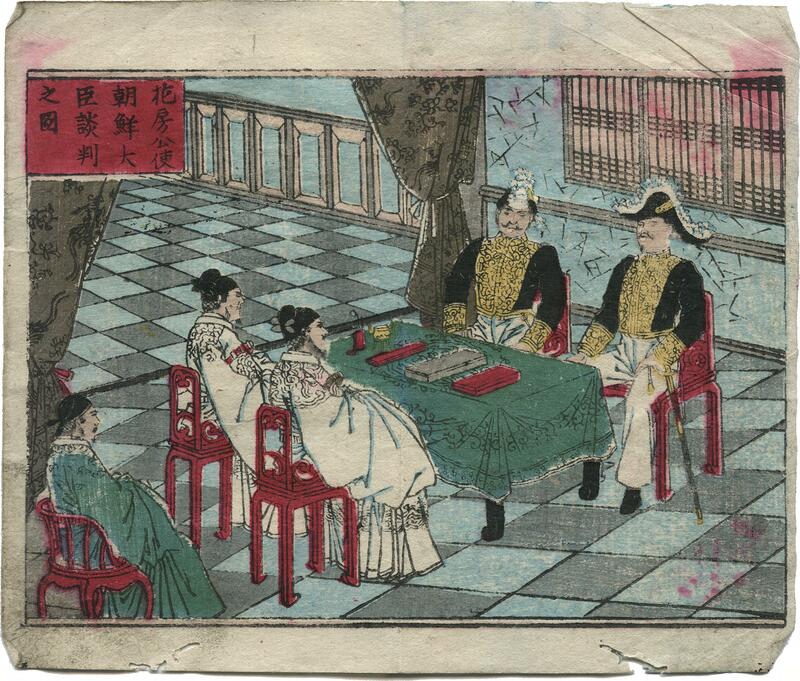 The frontispiece of the latter shows a poetry contest in the imperial palace, taking place before the empress and with the genders separated (fig. 8). A poem by Arisugawa Taruhito no Miya is included. Among his other accomplishments Taruhito was known for his interest in poetry and there was a distinctive Arisugawa-style of calligraphy that was used for poetry (of which the present poem may be an example). The collection proper starts with the Chancellor (dajō-daijin) of the day, Sanjō Sanetomi (aka Saneyoshi). It would perhaps appear that inclusion of the emperor and empress was somehow seen as lese majesty, and so the collection begins with the highest-ranking government official. 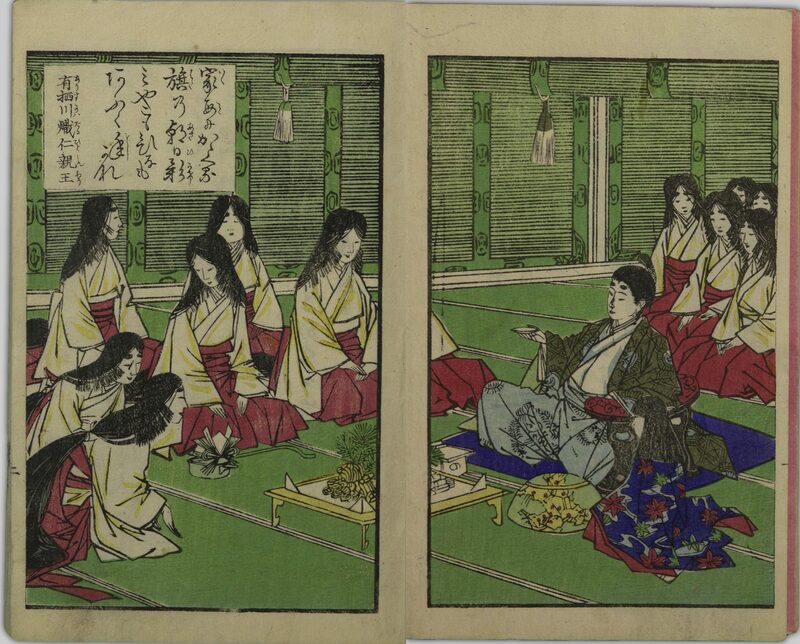 It is fascinating, however, how different the frontispiece of the original version is, with Prince Taruhito drinking saké and essentially deshabillé bareheaded, surrounded by young female palace attendants (fig 9). Fig. 8. A Poetry Contest in the Imperial Palace, (Genkon) Eimei Hyakushu. Shintei Ōta. ed. ; Sensai Eitaku, illus. Rikiishi Yasunosuke, Meiji 14 (1881). Source: UBC Library, Rare Books and Special Collections, Mostow_029 (Click to enlarge, or visit source here). Fig. 9. Prince Arisugawa with serving ladies, (Genkon) Eimei Hyakushu. Shintei Ōta (Numajiri Kai’ichirō), ed. ; Sensai Eitaku, illus. Nagoya: Kajita Kansuke (Bunkōdō), 1881 (Mostow_008). Source: UBC Library, Rare Books and Special Collections, Mostow_008 (Click to enlarge, or visit source here). While there is of course overlap with the previous collection (for example, Iwakura, Fukuzawa, Fukuchi, Hirobumi, Shibusawa, Atomi–and Okuhara Seiko looking much less androgynous than in the previous volume), some of the new inclusions are remarkable. First is the inclusion of Yanagihara Naruko (029_011), the concubine (gon no tenji) of emperor Meiji who gave birth to the son who would eventually become emperor Taishō. Curiously enough her position as concubine is stated, and she is praised for her poetry, learning and compassion, but no mention is made of the child she bore in 1879. 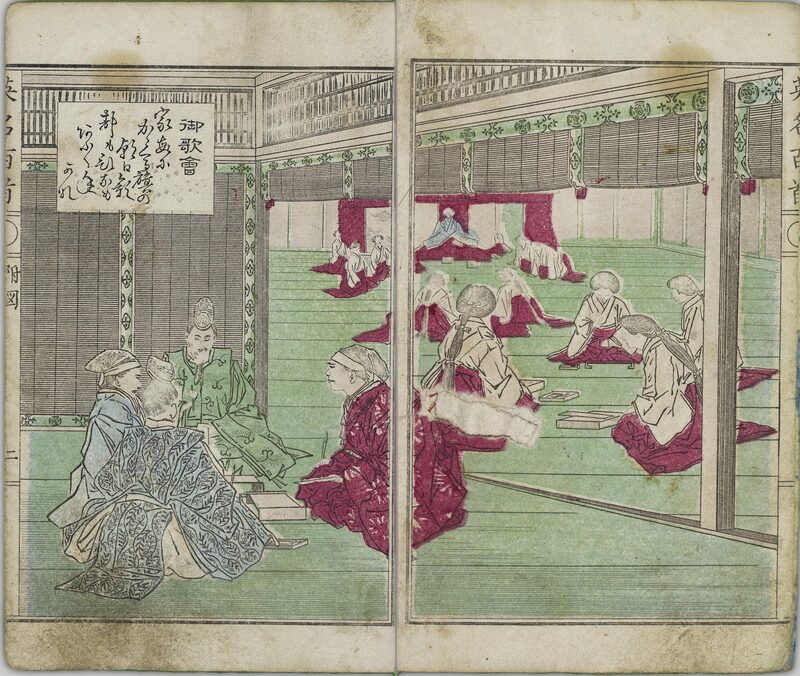 The volume also includes oiran of the pleasure quarters, such as ImaMurasaki of the Golden Vase brothel (_021). A startling pairing is KoMurasaki of the Ebirō on the right, and Tenshō-in, an adopted daughter of the Shimazu clan and the consort of the thirteenth shogun Iesada (_079) on the left. Fig. 10. Tenshō-in and KoMurasaki of the Ebirō, (Genkon) Eimei Hyakushu (Nagoya). Source: UBC Library, Rare Books and Special Collections, Mostow_008. (Click to enlarge, or visit source here). Iwakura’s given name is again mis-read (this time as “Tomonori”) as is Yanagihara’s (“Yoshiko”). One wonders what the author used as his source of information. It is also important to realize that writing about many of these kinds of personages was something completely new. Tokugawa censorship laws had forbidden any depiction or reference to the shogunate or any government officials or any member of the military elite or their ancestors. In the Edo period, “public personalities” were limited to commoners. The 1880s represented a decided shift in Japanese attitudes towards the West and towards their own history. There was a re-affirmation of the past, after decades of viewing the Edo period as feudal and backwards amidst a rush towards westernization. 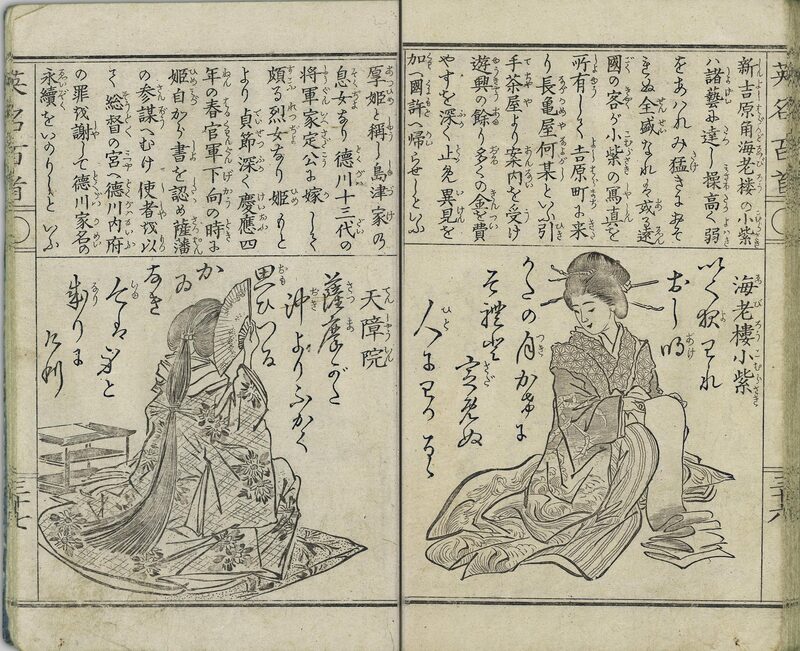 During the Edo period, woodblock-printed books depicting famous courtesans accompanied by poems in their own calligraphy were not uncommon, the most famous one being produced by Suzuki Harunobu. And the monogamy of the emperor would not be celebrated until Taishō’s marriage. The (Genkon) Eimei Hyakushu seems to embody some of this new self-confidence. 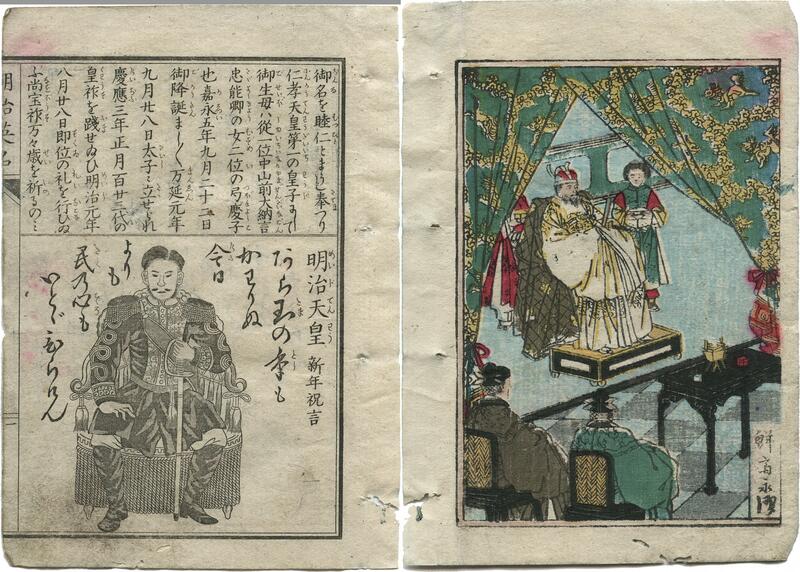 The Meiji Eimei Hyaku’ei Sen was also reprinted, in 1883, also in metal type in small format. There are interesting differences between the illustrations, however. While in the earlier work the Meiji emperor was hidden by a blind and on traditional tatami (fig. 5, above), in the 1883 edition he is in full Western military uniform and seated on a chair, presaging Edoardo Chiossone’s famous portrait of 1887 (fig. 12). 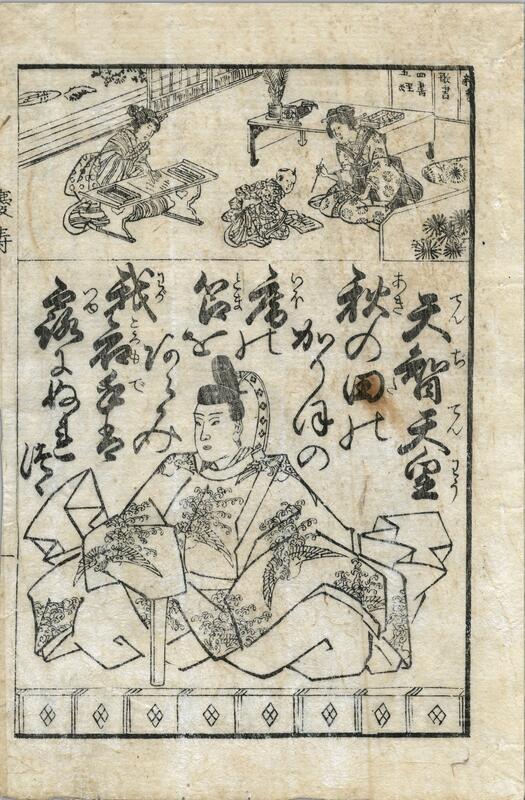 Similarly, while earlier the empress had been depicted as a Heian beauty with her face averted (fig. 6), in the 1883 version she stares straight out at the viewer. But most remarkable of all is the frontispiece, which shows Ambassador Hanabusa Yoshitada negotiating with the Korean prime minister while the king of Korea is shown in the background (figs. 11 and 12). This is presumably the Treaty of Chemulpo (1882), which established a permanent garrison of Japanese troops in the Korean capital. Fig. 11. Ambassador Hanabusa in negotiation with the Korean prime minister, Meiji Eimei Hyakushu. Fukujō Komatarō, ed. ; Hasegawa Chikuyō, illus. Tokyo: Bunseidō, 1883. Source: UBC Library, Rare Books and Special Collections, Mostow_010. (Click to enlarge, or visit source here). Fig. 12. The King of Korea and Emperor Meiji, Meiji Eimei Hyakushu. Source: UBC Library, Rare Books and Special Collections, Mostow_010. (Click to enlarge, or visit source here). The UBC collection includes a number of other hyakunin isshu from the Meiji period. 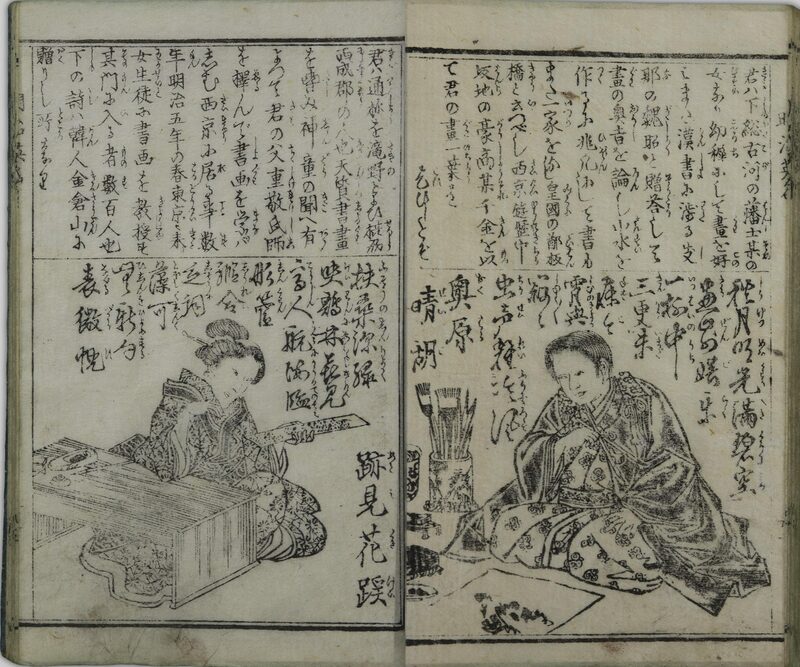 Some, like the Kinsei Meifu Hyakunin Sen (One Hundred Selected Famous Women of the Recent Past, 1881, Mostow_080), follow the pattern of exemplary women set by Senryū V and Utagawa Kunisada. Some take a historical bent, such as the (Meiji Senki) Tokugawa Gishiden ([Meiji Battle Records] Biographies of Tokugawa Loyalists, 1883, Mostow_027). And all during this time the Ogura HNIS itself was being constantly republished, from reprints of Edo-period editions that take no account of the tremendous political change that had occurred (such as the Keiju HNIS of 1888, fig. 13), to newly created versions published with copperplates, such as the (Meiji Shinkoku) Ogura HNIS Zen ([Meiji Newly Printed] Ogura HNIS Complete, 1885, fig.14). Fig. 13. Emperor Tenji, Keiju HNIS. Zen. Tokyo: Mizuno Kō. Meiji 21 (1888) (Mostow_093). Source: UBC Library, Rare Books and Special Collections, Mostow_093 (Click to enlarge, or visit source here). Fig. 14. Komiyama Gorō, ed. (Meiji shinkoku) Ogura HNIS. Zen. Tokyo: Sekine Kōsuke (Kin’eidō), Meiji 18 (1885). Source: UBC Library, Rare Books and Special Collections, Mostow_86 (Click to enlarge, or visit source here). “Arisugawa no Miya Taruhito Shinnō,” Wikipedia, accessed 20 April 2018. “Arisugawa-ryū,” Wikipedia, accessed 20 April 2018. Ariyoshi Tamotsu. “Ishu Hyakunin Isshu,” Kokubungaku: Kaishaku to Kanshō, vol. 48, no. 1 (1983): 124-131. Atomi Gakuen Tanki Daigaku Toshokan zō Hyakunin isshu kankei shiryō mokuroku. Tokyo: Atomi Gakuen Tanki Daigaku Toshokan, 1995. Atomi Gakuen Tanki Daigaku Toshokan zō Ishu Hyakunin isshu kankei shiryō mokuroku. Tokyo: Atomi Gakuen Tanki Daigaku Toshokan, 1999. Frédéric, Louis. Japan Encyclopedia, trans. Käthe Roth. Cambridge, MA: The Belknap Press of Harvard University Press, 2002. “Gose Senyū,” accessed 20 April 2018. Mostow, Joshua S. “The Revival of Poetry in Traditional Forms,” in Joshua Mostow, ed., The Columbia Companion to Modern East Asian Literature. New York: Columbia University Press, 2003, pp. 99-104. Sasaki Nobutsuna. Hyōchū Nanashu Hyakunin Isshu. Tokyo: Senbunkan, Meiji 26 (1893). “Yonse Senryū,” accessed 20 April 2018. Mostow, Joshua S. Pictures of the Heart: The Hyakunin Isshu in Word and Image (Honolulu: University of Hawai’i Press, 1996). 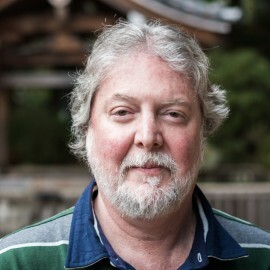 Joshua S. Mostow is a Professor in the Department of Asian Studies at UBC. In addition to his study of the reception of HNIS, he is also author of Courtly Visions: The Ise Stories and the Politics of Cultural Appropriation. Japanese Visual Culture 12 (Brill, 2014).